The first time I tried an A5 Wagyu steak, I was blown away at the mouthwatering rich flavor and the soft, tender texture. The experience was like warm butter melting in my mouth. I had never had a cut of meat quite like it. 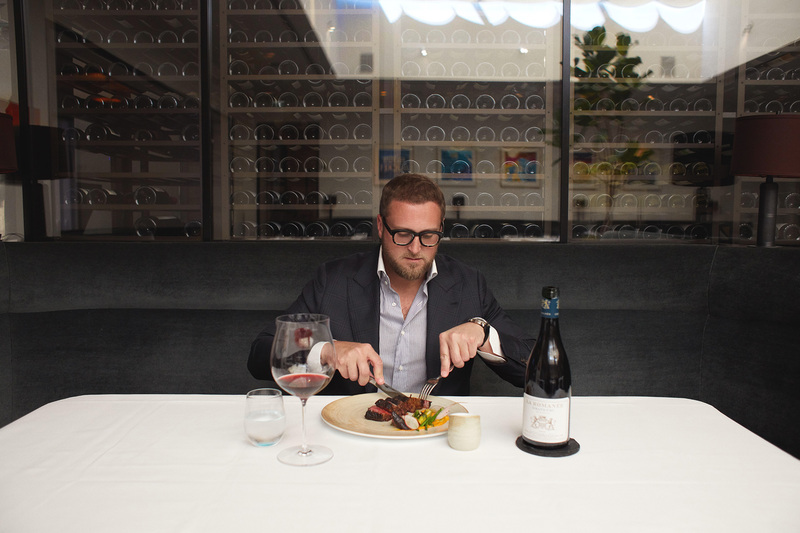 Now it is one of my favorite meals at Spago in Beverly Hills, paired (in this picture) with one of my favorite Burgundies, La Romanée Liger-Belair. For those of you who want to know a little more about it, I wanted to share my own thoughts and insight. I love the entire experience, the way it makes me feel with every bite. It is the incredible flavor, the texture, and the way it pairs with my favorite wine. But I am so impressed with the entire story. Just like anything, when you understand the history, the process and the painstaking details that were put into creating something on this level, you have such an elevated appreciation for it. When you are sitting down to enjoy that first bite, you realize all of the passion, discipline and work that took place before the experience could happen. It starts with the slow and thoughtful process of breeding the Wagyu cattle, serving them only the best feed accompanied with clean water to drink. Then they allow it to mature to up to 32 months, (much longer than normal cattle) for the ideal quality & texture. Then finally the restaurant, where a passionate chef has created the perfect preparation, cooking environment and presentation. Pairing it with accompaniments and wine to bring out the flavor of the entrée. Wagyu beef comes from cattle that are bred just for the purpose of creating the best flavor possible. The cattle live a sedentary life and eat frequently and are bred up to 30 months to create more of an evenly distributed, marbling effect in the beef. The result is a high-quality beef with unsurpassed taste. This references the score from Japan’s Meat Grading Association that provides a score from 1-5 based on marbling, firmness, color and quality and an A-C score based on the ratio of meat to weight of cow’s carcass. I even read that the National Livestock Breeding Center maintains the records of the cattle tracing back to their ancestry and history and can actually trace a steak from a restaurant back to its origins. Now that impressive history and details. Most Wagyu beef is either A4 or A5, due to its superior standards. I have had the luxury of experiencing the A5 Wagyu all over the world, at some of the best restaurants. But for me, Spago is still my favorite because of the way it is served. They offer the A5 Kuroge Wagyu from Miyazaki in a New York cut. But it isn’t just the cut or the grade, it also is about the way it is cooked. 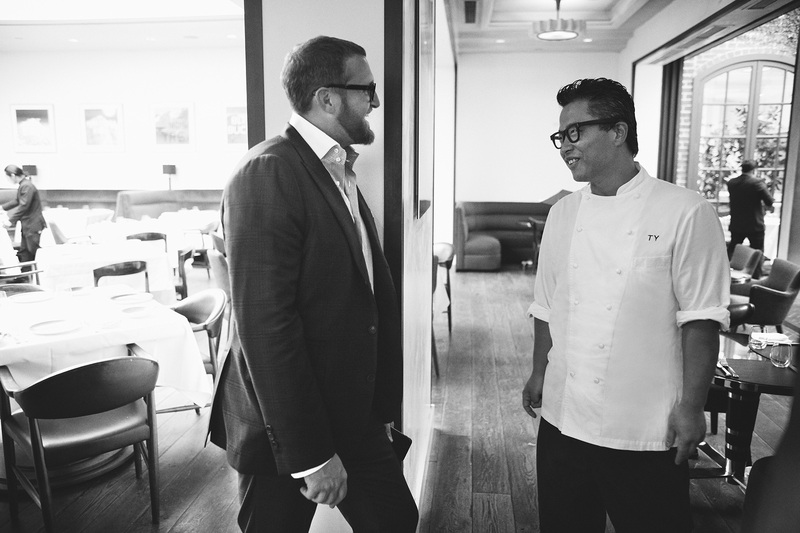 Tetsu Yahagi, the chef at Spago is originally from Japan and is very familiar with this Japanese beef. He believes Wagyu should be cooked over an open fire charcoal grill at a higher temperature to give it the crisper, well done exterior that almost melts the fat inside, while keeping the interior meat rare. You can have the best grade of Wagyu, but if it isn’t cooked properly, you won’t get the real experience. How It Should Be Paired with Wine. 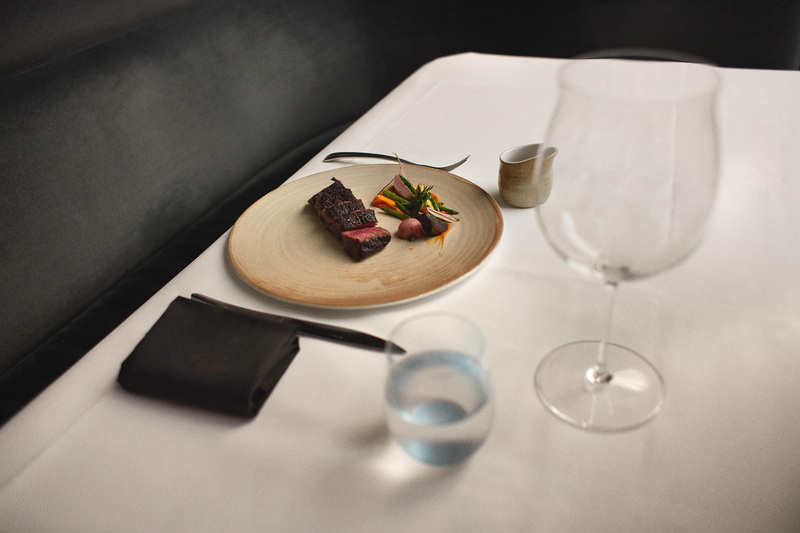 There are so many amazing wines to pair with Wagyu. You could go with a Napa Cabernet, a French Bordeaux or even some of my favorite Italian wines, depending on the climate and the time of day. Today’s shoot was lunchtime and most wine connoisseurs including myself, would go for a Burgundy, like the Romanée-Conti, as it is one of the finest and most expensive Burgundies. 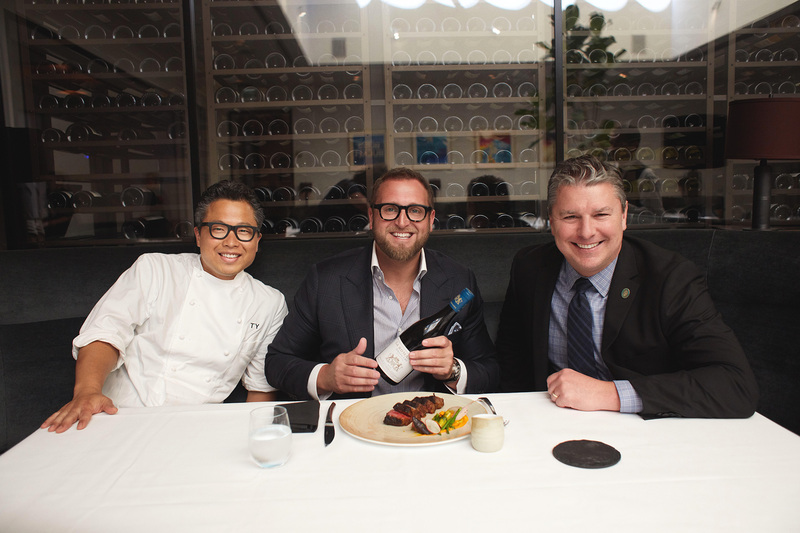 I love exploring wine with Philip, the Wine Director at Wolfgang Puck’s restaurants. 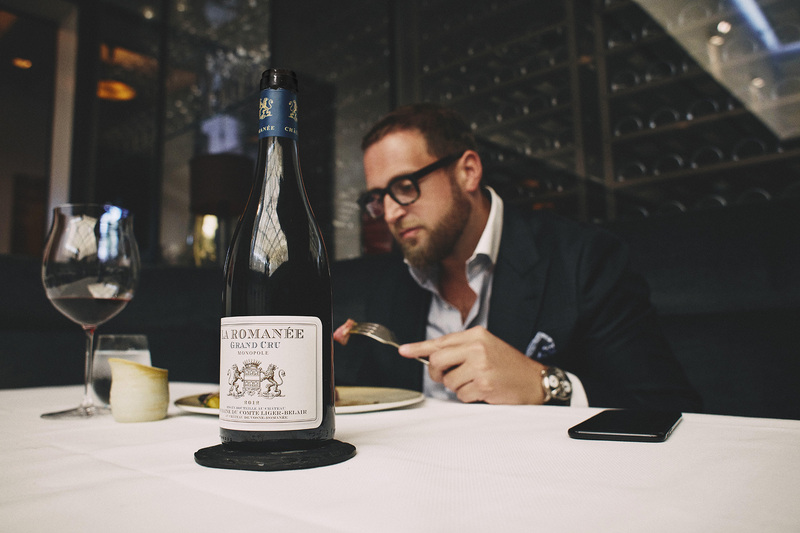 We knew the Romanée-Conti would be a predictable choice, but we wanted to have some fun. I wanted to pair it with something special for this lunchtime entree, so we decided on the La Romanée Liger-Belair. With only 300 cases produced a year on this historic estate in Burgundy, consider yourself lucky if you have the opportunity to experience this. The main grape variety used for La Romanée is Pinot Noir and when you open the bottle, you immediately get those aromas of black berries and cherries. The perfect complement for enjoying Wagyu at lunchtime. Now, the next time you at the restaurant for a lunch meeting or out to dinner with friends, you can explore the menu and indulge in something truly remarkable, with an even deeper appreciation for the experience.